Most of our contemporaries would reply to this question: "Yes, bees!" - which are indeed a magnificent example of an organised society grouping a lot of individuals which are allocated various complementary tasks, but bees are not the only types. If the criteria has to do with the numbers attained by social insects, the correct reply should be: "Ants ", as quite often their colonies consist of millions of members. Another important argument in their favour is their extraordinary capacity to live in very different climates, such as deserts, which would be considered as openly hostile for many other species. However, the idea of referring to bees is not outside of the context of "Formicidae", since, like wasps and ants, bees are also part of the hymenoptera order, which are cousins that have been profoundly changed by evolution over millions of years. If we were to speak of their origins, scientists would say that their remote ancestor would be a type of wasp which lived a hundred million years ago, since they have conquered the planet, except for glacial or submerged zones. The word ‘diversity' may have been invented to describe them, since they present very significant morphological differences between species, the smallest measuring less than one millimetre in length and the biggest, more than 3 centimetres. To make a comparison with man, if the smallest among us would be not more than a metre tall, the biggest would be 30 metres, the equivalent of a 10-storey building, meaning that it would be extremely difficult to find things to wear or eat. Speaking of food, one of the major values of ant colonies is the existence of different "jobs", which enables them to share the activities necessary for the survival of the group, with the Queen in first place of course, she deserves to be mentioned in upper case, because she lays all the eggs and is therefore the Mommy to thousands and thousands of kids, what a responsibility! 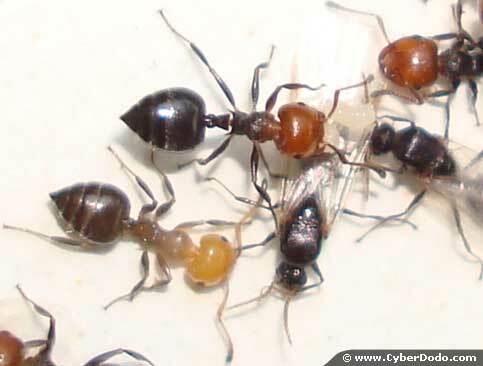 If the Queen is fertile, it is because she has the excellent assistance of drones, which have the dual task of feeding her as well as the larvae, while other ants with impressive physical development are going to guarantee the security of the colony: the soldiers.